All kinds of Power LED Downlight, Power LED Cabinet Light, Power LED Wall Washer and more. 1. 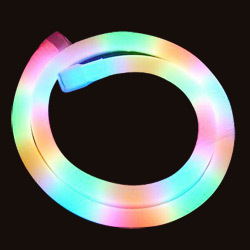 LED string light is a string of LEDs, a group of LEDs are connected together to form a string. When powered on, all LEDs in the string will light immediately. 2. A complete set of string light consists of a power cord, a LED string and an end. The end of each LED string is designed extendable, which can be blocked with an end cap, or can be coupled with next LED string. 3. They are very convenient to be used mainly for decoration of trees, plants with hard stems or any other objects. Especially for Christmas and holiday decorative lighting. 1. Rated voltage: 24V, 230V. 2. Long lasting for 40,000 hours. 3. Easy to assemble and maintain. 4. Extendable. 5. For given rated voltage and LEDs, the length of string light set and LED space can be adjusted according to customers' specifications.